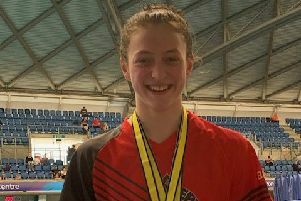 Mollie Allen would appear to be City of Peterborough Swimming Club’s (COPs) best hope of a gold medal in the British Summer Championships in Sheffield this week (July 27-31). Allen (18) is ranked number one for the 50m backstroke and number two in the 50m freestyle in her age group. Thirty COPs swimmers will travel to Ponds Forge. They’ve qualified for the British Championships by earning a ranking in the top 24 in their age group, or a ranking between 25-44 for the ASA National Summer Championships which follow immediately afterwards (August 1-5). Other COPs swimmers expected to go well next week are Jamie Scoles (16) who is ranked two in the 200m backstroke, and USA-based Chloe Hannam (20) who is ranked two in the 200m breaststroke. Scholes is however fighting his way back from illness. Hannam (20) won bronze at the British champs in April which was also the Olympic qualifying event. She is also ranked number two in the 200m breastroke. Hannam trains in USA where she’s at University but competes and trains for COPs in the UK. COPs squad: Boys: Cameron McRae, Herbie Kinder, Harvey Norman, Henry Pearce, Harry Whiteman, Joshua Greaves, Jamie Scholes, Jaxon Simmons, Liam Knight, Matthew Gray, Matthew Rothewell, Miles Robinson-Young, Thomas Wiggins. Deepiongs swimmers attending the British Summer Championships: front Miki Lin-Gao, back from left, Bailie Harrison, Alex Wray, Isabel Spinley. Girls: Anna Blakeley, Amelia Monaghan, Aisling Ruff, Bethany Saunders, Chloe Hannam, Holly Jaszkiewicz, Jade Goode, Mackenzie Whyatt, Lauren Harrison, Leah Roughan, Mollie Allen, Mia Leech, Maddie Saunders, Poppy Richardson, Rerbbeca Burton, Rachel Wellings, Taylor Goodby. Deepings Swimming Club will also be represented at the Championships by Isabel Spinley, Bailie Harrison, Miki Lin-Gao and Alex Wray. Spinley is ranked eighth in the 16 year age group for the 200m butterfly, 13th for the 50m butterfly and 11th for the 100m butterfly. Harrison is ranked 14th in the 16 year age group for the 100m butterfly and 34th for the 50m butterfly. Wray is ranked fourth in the 18 year age group for the 50m free and third for the 100m freestyle. Miki Lin-Gao is ranked second on the British Junior Age Group Rankings for category S8. She is also currently ranked 3rd in category SB6 for 50m breaststroke.